This item is a Paper in the XML and Web Data track. Since more and more business data are represented in XML format, there is a compelling need of supporting analytical operations in XML queries. Particularly, the latest version of XQuery proposed by W3C, XQuery 1.1, introduces a new construct to explicitly express grouping operation in FLWOR expression. Existing works in XML query processing mainly focus on physically matching query structure over XML document. Given the explicit grouping operation in a query, how to efficiently compute grouping and aggregate functions over XML document is not well studied yet. 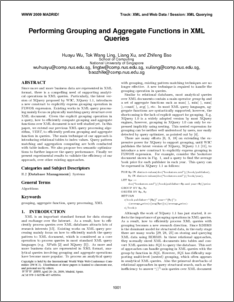 In this paper, we extend our previous XML query processing algorithm, VERT, to efficiently perform grouping and aggregate function in queries. The main technique of our approach is introducing relational tables to index values. Query pattern matching and aggregation computing are both conducted with table indices. We also propose two semantic optimizations to further improve the query performance. Finally we present experimental results to validate the efficiency of our approach, over other existing approaches.